The main principle of aquaponics is very simple and mirrors nature. Fish are grown in tanks and nutrient-rich water from these tanks is pumped into hydroponic beds where vegetables, herbs, flowers and other crops absorb the nutrients for growth and purify the culture water, which is returned to the fish rearing tanks. Although the fish are living in a tank, in essence they are being raised in a river where their waste products are swept away and replaced with clean water. The plants are grown in water containing high levels of oxygen and nutrients – everything they need – without the problems associated with soils, such as weeds, soil diseases and pests, heavy metal and other toxicant issues and an often-experienced lack of oxygen or moisture. Plants remove only the water they need for growth. 1) In recirculating fish culture systems, large amounts of water are discharged to prevent nutrient build-up. In aquaponic systems, these nutrients do not accumulate as they are utilized to produce a valuable second product – the plants. Removal of these nutrients by plants greatly reduces discharges of fish culture water to natural water bodies, which protects our lakes, rivers and the wider environment from nutrient enrichment and excessive algal growth. 2) Fish excrete ammonia, which is toxic at high levels. A biofilter is required to remove ammonia. In some aquaponic systems the plants and hydroponic growing beds become the biofilter, thereby eliminating the need for a separate and expensive biofilter. There are many types of biofilters in the aquaculture industry, but when the hydroponic growing bed is used for biofiltration it is the only biofilter that earns money. 3) Correctly designed aquaponic systems are well balanced ecosystems where the nutrients generated by the fish are absorbed by the plants. There is no need to monitor the numerous water quality parameters as required in separate recirculating fish culture or hydroponic systems, saving considerable time and expense. Aquaponic systems are therefore robust and very easy to operate and maintain. The average hobbyist or farmer can operate an aquaponic system quite successfully. 4) The profit potential of commercial aquaponics is increased due to the availability of free nutrients for the plants, lower water requirements, elimination of a separate biofilter in some aquaponic design approaches, less water quality monitoring and shared costs for operation and infrastructure. In addition, the plant crops cannot be sprayed with chemical herbicides or pesticides, so they can be marketed as “spray free”, which brings potentially higher profits. 5) Since aquaponic systems can produce fish and vegetables intensively throughout the year outdoors in suitable climates or in environmentally controlled greenhouses and land requirements are minimal, systems can be located near urban markets, thereby reducing transportation costs and providing fresh, high quality fish and plants. 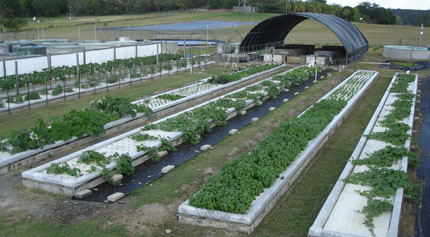 In fact, aquaponics may be located almost anywhere. 6) Aquaponic systems produce two crops from the one input source; the fish feed. In addition, the vast majority of the nutrients added to the system via the fish feed stay in the system and only leave as profitable fish and plant products. This makes aquaponics far more efficient in terms of nutrient utilization than other farming systems.